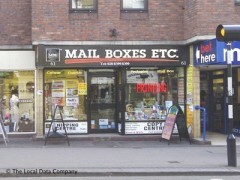 "Mail Boxes Etc. offer worldwide parcel delivery, courier or postal services; print and copy; mailbox rental and virtual office packages"
- Packing & Shipping for business or personal delivery. - Professional Print Solutions, including; litho print, short-run digital printing, photocopying, binding, laminating, booklet making and more. - Mailbox solutions tailored to your business or personal needs. Please call or visit us on-line for a quote and more information.